Early show at the Wail on 42nd and Killingsworth. Lots of bands, short sets, starts at 7pm, everything is done by 10. The Sacramento Bee reports that Aaron Zeff, the man behind Buk Buk Bigups, was recently approached by two dark-suited IRS agents at his business, Harv's Metro Car Wash, to collect a delinquent text debt of 4 cents. He's also gotten props from upstanding KDVS radio program Art for Spastics and has a new LP on Weird Forest. Also playing will be Repressive Proteins, which has got Davy who used to be in Antennas Erupt!, who did an LP with S-S and were beloved by me and also by Pete Swanson. Also playing, Mom, and Night-People buddy/Eggy distro favorite Dirty Beaches all the way from Montreal. And the Polyps with a new vocals and tape loops set-up, the first live show in probably a year! Woolen Men at Rontoms on East Burnside with local and Eggy distro favs Nucular Aminals. It's FREE! And Experimental Dental School, newly renamed XDS. The Golden Hours at Holocene with the Globes from Seattle and Pepper Rabbit from LA. Also FREE! Also a special of some sort on Trumer Pils! Once again, the Woolen Men, this time at the Artistery. Really stoked to see Death Songs, the solo outlet for Nick of Shaky Hands. The lone Death Songs release is a tape on UHU which RULES! It was hard to find for a while there, but it seems to be in good supplies around town. Get one! $4! 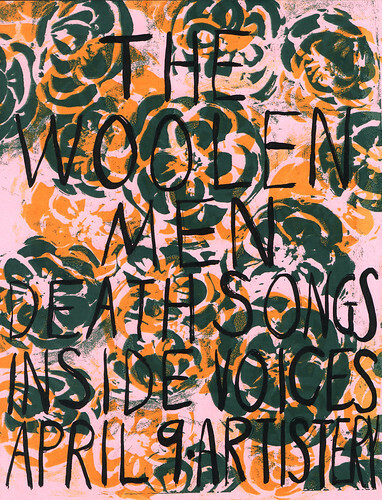 Also playing, super nice sounds of Inside Voices, Woolen Men played a gig with them really early on at Valentine's and it was great. I don't know how much this show costs. Not much, I hope!